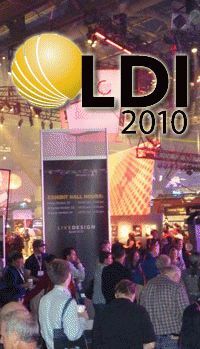 Call it the recession or call it a shake up in the lighting industry, the 2010 LDI Show in Las Vegas was smaller this year. Even though it was a little short on vendor booths, it came across as being a very intense show. When a chef makes a sauce, they go through a process that is called reducing. Reducing is simply thickening and concentrating a sauce by boiling it—moisture evaporates, and the sauce reduces in volume while the flavor intensifies. That is how LDI was this year. The booths were spectacular, the products were innovative, and the people were motivated. We may be a little jaded, but we felt the Elation booth took the show when it came to sheer raw power. It caught everyone’s eye as they entered the show with its choreographed lighting and two huge LED video screens. Add to everything one of the led displays in their booth included moving head LED video wall technology, and it was easy to say Elation hit it out of the park. Tucked in behind Elation we found Global Truss that had a number of new products including two that stuck out, the flat screen stand and the podium. With the fine curved lines of a 57 Chevy, both units rose from the floor, the podium topped off with a thick angled acrylic counter and the flat screen stand with a built-in bracket that appeared to be able to hold even the heaviest screen. Both will make even your choosiest client happy. Moving over to one of a few non-lighting companies that you would never think to look at, Drape Kings, a manufacturer of pipe and drape systems, introduced DJzone to their Portable Tabletop DJ Booth Surround package. Comprised of relatively few pieces, a Dj can attach this unit to any 6 or 8 foot table with the included clamps and have a completely draped table. This gives a DJ coverage starting at 19” off the top of the table all the way to the floor. The curtain portion of this setup can be ordered in most any color you want and is fire retardant. Jim from Irradiant Lighting introduced us to their new line of moving head LED lights, their flat LED par “cans” (guess you can’t call them cans anymore) and an LED micro light setup. The micro light system included 4 small LED lights. The mirror scanner, moonbeam, flood and strobe– all smaller than a 32oz Slurpie cup. This set of four ran off a 12 volt power source and included a controller. We loved the design and were excited about the concept, but we can’t really put our stamp on the micro light system for use outside of a very small venue or room. This being the industries first attempt at a miniature DJ LED lighting series, the brightness and power was just not there yet. We can’t wait to see it next year. Other booths we visited included the Tomcat Truss booth. Known best for their trussing being used in major concerts such as The Rolling Stones, Tomcat was impressive to look at, industrial you might say. Geared to the serious show producer and not so much the DJ, they cover the large production and concert niche with impressive ease. Not to be left out of the mix, both American Audio and American DJ were present. Tom Ferret with American Audio was showing off his customized VMS4 digital work station. The customization was a slick Las Vegas skin by Styleslip. For those that don’t know the VMS4, it is one of the most talked about portable digital controllers on the market. It includes a version of Virtual DJ 6LE that is upgradable to the latest version 7. American DJ gave us a quick run through of a few of their new lighting options like a multi-color LED pinspot that can be set to a single color or has a built-in sound sensitive color change mode. They also had on display an upgraded MegaBar system where you can set and mix each color channel via remote. At the touch of a button, you can change the color of a room without DMX and without a wired controller. The LDI Show really allows us to see exactly how close the DJ industry is to the stage and concert industry. When you have so many DJs expanding into specialty lighting and production, crossovers from the stage industry are bound to happen. Even with a smaller amount of vendors, the LDI show is a fantastic show.